It feels like forever ago that I made my duck egg ravioli and at the time I was challenged to place an egg yolk into some pasta without any support. More recently I decided to make ravioli with a traditional spinach and ricotta filling. However, to make this a bit more interesting I decided to add an egg yolk to the centre of the ravioli as well. This is much easier than using an egg yolk alone, as you create a nest for the egg with the spinach and ricotta. The only time that you need to be gentle is when you cover the egg with a sheet of pasta to form the ravioli. The egg makes a great sauce for the pasta but I decided to make a burnt butter sauce to go with it just to make it slightly more decadent. What a gorgeous recipe! I’m having company over next week and I might just try my hand at these! Love this idea!! Will be trying soon! Wow, these ravioli sound amazing! I always love a runny egg yolk. 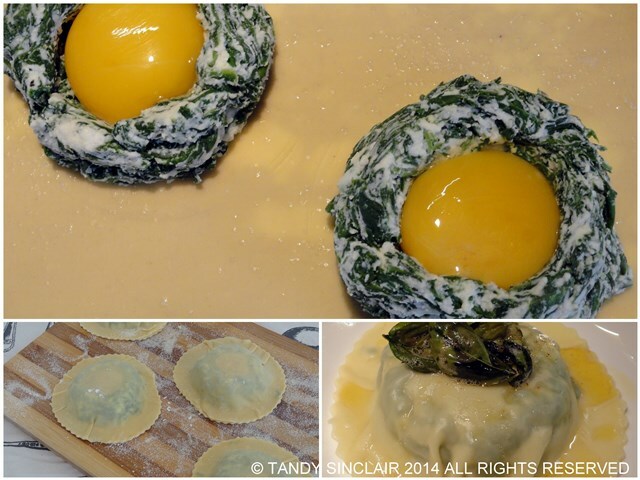 I adore eggs and have never seen a ravioli like this. Bookmarking this page for when cooler temps come back. Wow!! These are so fun!! I’ve seen these on Italian TV. Tandy, yours turned out fantastic! Probably not easy…. That was so creative, Tandy! I just love to take a fork and start digging in :). Thanks for sharing this pretty ravioli! Thank you for the compliment Julie! this is really fabulous tandy. looks so good.! What a sophisticated dish Tandy, love everything about this! This is so impressive, Tandy! I suppose you cook the pasta just long enough to cook the egg but so that it is still nice and runny. Making my own pasta is definitely on my food bucket list. It’s one of those things that I’d love to do but am still a bit nervous about, for some reason. I reckon I need to get over that and just have a go! I smiled before I even read the title! How are you always so deliciously creative?? I’ve never made ravioli before so I’m eager to try my hand at yours. I’m particularly intrigued by your burnt basil butter sauce, sounds so good and yet I’ve never thought to use basil in this way before. And I have a ton of it growing in my garden that needs to get used! What a beautiful and delicious meal you created…well done! I so understand about not making dishes that someone you live with does not enjoy!